Muscadine grapes are native to America and grow vigorously in the southeastern half of the nation. Muscadines have a high degree resistance to most diseases, and therefore are prolific climbers and survivors of this hot and humid region. The fruit which varies in size and color depending on the variety, has a distinct fruity, or "musky" aroma, while the juice by itself is sweet. The fruit is very popular in the southern states for all sorts of purposes. Of course Bayou Lacroix uses these wondrous berries to make a distinct tasting wine. Here is an insert from North Carolina University horticulture dept. Muscadines grapes, (Vitis rotundifolia, or, alternatively, Muscadiniana rotundifolia) are often referred to as scuppernongs. Muscadine is native to Southeastern United States and has been cultured for more than 400 years. Native Americans preserved muscadines as dried fruit long before the Europeans inhabited this continent. As early as 1565, Captain John Hawkins reported that the Spanish settlements in Florida made large quantities of muscadine wine. For much of the history of the crop, varieties were simply selections from the wild. The first recognized muscadine cultivar was a bronze selection, found before 1760 by Isaac Alexander in Tyrrell County, NC. It was first known as the 'Big White Grape', and was later named 'Scuppernong' after the area in which it was found. With time, the name scuppernong became generic with all bronze muscadines, regardless of actual variety name. However, this is incorrect nomenclature since 'Scuppernong' is only one of many cultivars of muscadine grapes. 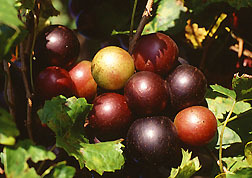 Bullis and its variants (bullace, bullet grape, bull grape) are very old names for dark-fruited muscadines. Some authorities have written that the name "Bull" grape reflects comparison of the berries with cow or pigs eyes; or, alternatively, muscadines were called "Bullace" because of their resemblance to a European plum of the same name, and that Bullis, Bull and Bullet are all corruptions of the Bullace! Nearly 100 years of breeding work has resulted in the release of many improved cultivars. 'Carlos', 'Doreen', 'Nobel', 'Magnolia', and 'Nesbitt' are some of the most important cultivated varieties in the east and the south. Bayou Lacroix Vineyard currently grows Carlos and Southland Muscadine grapes. However there is a huge variety of muscadines on the market, I have listed most of these below. We plan to plant more vines next season to include noble, carlos, and a few bunch grapes varieties to include conquistador, Black Spanish, Blanc du Bois, and Cynthiana. Possibly some Seyval. African Queen - Black Female. Large, very sweet. Approximately 16% sugar. Medium thick skin. Very vigorous and productive. Ripens mid-season. Black Beauty - Black Female. 23% sugar. Dry scar, large fruit, skin edible, ripens uniformly, large clusters, very vigorous, one of the best black varieties. Ripens mid - late season. Black Fry - Black Female. 19% sugar, very productive, good quality, ripens uniformly, large clusters, disease resistant. Comparable with Fry. Ripens early - mid season. Dixieland - Bronze Self-Fertile. Large fruit. Similar to Fry in flavor, color and size. Excellent flavor. Ripens mid - early season. Dixie Red - Red Self-Fertile. Vine vigorous. Quality very good. Large clusters. High yields. Ripens mid-season. Farrer - Black Female. Large clusters, 18% sugar, excellent quality, high yields, dry scar, vigorous. Ripens early. Granny Val - Bronze Self-Fertile. 16% sugar, high yield, excellent quality. Ripens mid-late season. Very heavy producer. Ison - Black Self-Fertile. 19% sugar, very productive, ripens uniformly, large clusters, dry scar, early-mid season. Best black pollinator. Janebell - Bronze Self-Fertile. Large size, clusters, good quality, very productive, dry scar, disease resistant, mid-late season. Janet - Bronze Female. 21% sugar, very large, excellent quality, wet scar, large clusters, very productive, cold hardy. Latest ripening bronze female. Pineapple - Bronze Self-Fertile. 16% sugar, large fruit and clusters, most productive and vigorous, good quality, disease. Taste similar to pineapples. Mid-late season. Rosa - Pinkish Red Female. 18% sugar, best of the red grapes, very vigorous, good quality, wet scar, very sweet. Very good for home use and pick your own. Mid-late season. .
Scarlet - Red Female. New Release from Dr. Ron Lane of University of Georgia Experiment Station. Good size and quality. Senoia - Pinkish Bronze Self-Fertile. 16% sugar, large clusters, dry scar, vigorous and productive. Produces an excellent light red wine. Ripens mid-season. Sugargate - Black Female. 23% sugar, vine very vigorous, very large and excellent flavor. Dry scar, large clusters. Ripens early season. Not recommended for Gulf Coast area. Sweet Jenny - Bronze Female. 23% sugar, large clusters, vigorous, disease resistant, early-mid season. Darlene - Bronze Female. The best of the bronze scuppernongs. Consistently large size throughout vines, not erratic. 24% sugar, dry scar, melting pulp, excellent quality. Early Fry - Bronze Female. This is the variety everyone has been waiting for. You asked for an early one and this is it. Ripens two weeks earlier than Fry. Very large, very high yields. Ripens uniformly in clusters, easy to pick. 19 - 21% sugar. Early Fry - Bronze Self-Fertile. 18 - 20% sugar. you asked for a late variety, we have it now. Much improved over Granny Val. Very large clusters, good quality, ripens late. Very vigorous and very high yields. Pam - Bronze Female. Pam has the largest clusters of grapes in production. It is the heaviest producing female of all the varieties. Dry scar. Supreme - Black Female. Best of the black scuppernongs. Many people have changed their minds choosing Supreme over bronze. It is the largest muscadine developed at this time. Very heavy producer. 23% sugar. Ripens mid-late season, very vigorous, skin edible, large clusters, disease resistant, dry scar. Fry Seedless - Red Self-fertile. Fruit is red color, similar to Redgate, medium size, 20% sugar, yields erratic. Vine is vigorous. Is self-fertile, yet needs to be planted by another self-fertile variety. Carlos - Bronze Self-Fertile. 16% sugar. Medium size, good quality, ripens early-mid season. Clean scar, very productive. Excellent for wine. Cowart - Black Self-Fertile. 17% sugar, excellent flavor, large clusters, medium size, very productive. Ripens early season. Doreen - Bronze Self-Fertile. Medium, large clusters, dry scar, excellent quality, 17% sugar, excellent wine grape, ripens mid-season. Florida Fry - Bronze Self-Fertile. 18% sugar, good quality, disease resistant, very vigorous. Excellent for fresh fruit. Ripens early-mid season. Fry - Bronze Female. 21% sugar, very large fruit and clusters. Excellent quality even before fully ripe. Ripens over whole season. Higgins - Bronze Female. 16% sugar, vine vigorous, skin thick and edible, color pink to reddish bronze, production high. Ripens mid-late season. Hunt - Black Female. 17% sugar, medium size, large clusters, good quality, excellent for jams, jelly, cold pressed juice and wine. Ripens early. Jumbo - Black Female. 15% sugar. Very vigorous, good when allowed to fully ripen, large fruit size. Ripens early-mid season. Magnolia - Bronze Self-Fertile. 15% sugar. Medium size, good quality, excellent for wine making, very productive. Ripens mid-season. Nesbit - Black Self-Fertile. 18% sugar, large clusters, very productive, disease resistant, dry scar, ripens over long period. Mid-late season. Noble - Black Self-Fertile. 16% sugar, medium size, quality very good, large clusters, recommended for red wine. Ripens early-mid season. Scuppernong - Bronze Female. 17% sugar, excellent flavor, clusters small, a variety all people know, production good. Ripens mid-season. Southland - Black Self-Fertile. 17% sugar, medium-large fruit with excellent flavor. Vigorous, disease resistant. Ripens mid-season. Summit - Red Female. 20% sugar, excellent quality with great production. Ripens mid-season. Tara - Bronze Self-Fertile. 17% sugar, good size, very vigorous, high yields, dry scar and cold hardy. Ripens early-mid season. Triumph - Bronze Self-Fertile. 18% sugar, dry scar low to medium production. Ripens early-mid season. The planting of a muscadine vineyard should be planned out and several considerations taken into account. Plant in direct sunlight, and on a well drained hill side if possible. Try to avoid any trees to close to the vines, as this can cause problems if the trees grow out and over the vines. Plan your drip irrigation system, and your trellising system. Know when to water and how to prune. How will you train them? What is expected during the first years of growth? These are questions that can easily be answered with a little research and some planning on your part. We personally prepare the ground to be planted upon, about 6 months to a year ahead of time. The field is plowed several times to a depth of 2-3 feet, and all the vegative growth is kept tilled into the soil until time of planting.. This means plowing with the tractor several times over the winter months.. During this time you should test your soil for PH and other compounds. You will likely need to lime the soil also, this can be done during field plowing. Always wait until there is little chance of sub-freezing temperatures before spring planting. Potted plants are easier to hold until the proper planting time, but bare-root plants are satisfactory if the roots are kept moist (not wet), and the plants are refrigerated until planting time. Plant at the same depth or slightly deeper than the previous planting depth. Vines should be a minimum of 10 feet apart in the row, but more desirably, 20 feet apart. Distance between rows can depend on the equipment used for mowing, but 8 feet should be a minimum. I suggest installing your trellising system first, and training your vines to the trellis wires during growth. These side shoots should be cut back to 2 to 3 buds during the dormant season. The next season, the buds on these side shoots will develop into shoots that produce flowers and fruit. Each dormant season, the lateral shoots must be cut back to 2 to 3 buds by hand or with a hedge trimmer. In general, Bayou Lacroix runs one or two strings from a stake in the ground up to the trellis wires. We have several Muscadine varieties that we have trained to have two trunks, so we used two strings. The strings are tied to horizontal trellis wires that are 2-3 feet apart. and each trunk is trained up a separate string. In a double trunk vine, each trunk will be trained up its own string to its own horizontal trellis wire, and then pinched out at the top to start shoots running each direction down the wire. In this manner each vine will ultimately have 4 fruiting arms/cordons. This will allow for heavier bearing of fruit on vigorous varieties. The type of trellis selected will often determine where the plant(s) can be established. A space at least 10 feet long by 6 feet wide should be provided for each vine. Decide on the trellis system and complete the construction before planting. Many types of trellising have been used successfully, but an equal number have been designed by homeowners that have not been practical for long-term management of vines. A practical system allows for establishing permanent cordons (arms), that can be easily reached for the required annual pruning. This requires training of the cordons to single strands of wire (No. 9 is recommended). Training to woven-wire fencing or overhead structures, where individual cordons are not maintained at least 4 feet apart, will be difficult to prune. A single wire 5 to 6 feet above the ground and well anchored on each end is the easiest trellis to construct and maintain. Four-foot cross arms of 2 x 6 inch treated lumber can be attached to treated posts to support double wires. The double-wire system will yield about 30% more than the single-wire system. Growing muscadine vines over a garden arch or a pergola can be aesthetically pleasing and provide shade, but if individual cordons are not maintained, management will be difficult, neglect is likely and fruit production will decline. Apply ¼ pound of 10-10-10 in an 18-inch circle around each vine after planting (late April-early May). Repeat every 6 weeks until early July. The second year, apply in early March, May and July at double the first year's rate (½ pound per vine). On bearing vines scatter 1 to 2 pounds of 10-10-10 uniformly under the vine (60 to 120 square feet) in early to mid-March. Apply another 1 pound in mid-June. If the average length of new vine growth exceeds 3 to 4 feet during the season, reduce the amount of fertilizer the following year by 20%. Continue adjusting fertilizer rate until the desired vigor (based on vine length) is obtained. To minimize winter injury, don't apply any fertilizer after early July. Avoid mulching materials that will release nitrogen late in the season and cause increased susceptibility to winter damage. I have seen Muscadines that have just recieved fertilization, and then get 2 hours of watering take off and grow like a weed. The water brings the fertilizer down to the roots, and the vines love it. The tips of the cordons will start to throw off extra shoots, and shoots will pop up all up down the runners. Keep an area 1 to 2 feet in diameter around each vine free of weeds by shallow cultivation for the first 2 years. A coarse, non-nitrogen releasing mulch such as bark will also help control weeds and reduce moisture loss from the soil. Muscadine grapes are quite drought tolerant. Water during dry periods the first two years, then the vines can usually obtain adequate water from the soil even during dry periods. Drip irrigation is best, and is very easy to install and maintain. A common garden hose with holes punched into it where it passes over the vine is very adequate for smaller vineyards...NEVER WATER THE LEAVES!!! Roots Only.